The Allapattah Flats family celebrated National Kids at Hope Day in conjunction with Veterans Day on Wednesday, November 12th. To honor all of our service personnel for our city, county, state, and country, Allapattah Flats proudly conducted a Tunnel of Honor. The entire school of over 1000 students and staff lined the school walkway, waving American flags and cheering for veterans, first responders, police, deputies, firefighters and Coast Guardsmen as they walked through the tunnel. These guests of honor were treated to a musical performance by the middle school band & chorus as well as our elementary chorus. Songs included military anthems and the Star Spangled Banner. Prior to the ceremony, each class created red, white & blue paper chains, naming a goal for the future in one of the destination points on a link. These paper chains were presented to the guests of honor. To conclude the ceremony, all invited guests came up with a link of their own and connected our paper chain together to form one long chain, showing the power of connecting and celebrating the role these Aces play in student’s lives, as well as the role the guests of honor play in the Community & Service Destination. In addition, students created Aces Pinwheels using construction paper and pencils. On each pinwheel, students were asked to name an Ace of Hearts, Ace of Clubs, Ace of Spades, and Ace of Diamonds on each blade of their pinwheel. Prior to the Tunnel of Hope, these pinwheels were placed in the grassy field, to spell out the letters “KAH,” for Kids at Hope, which could be seen from the third story in the school! 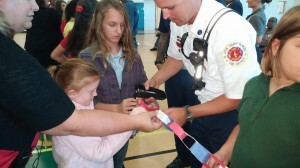 Desire Konicek and Kaitlyn Bright assist a St. Lucie County Firefighter in stapling paper chains together, with a little help from School Counselor Sheri Reichard.